The cartoonist, Charles Addams, became a master of American Gothic, as the result of his dry sense of humour and creation of a cast of delightfully macabre characters – including Morticia, Pugsley and Wednesday – who first appeared in The New Yorker, and later gained fame on television as The Addams Family. 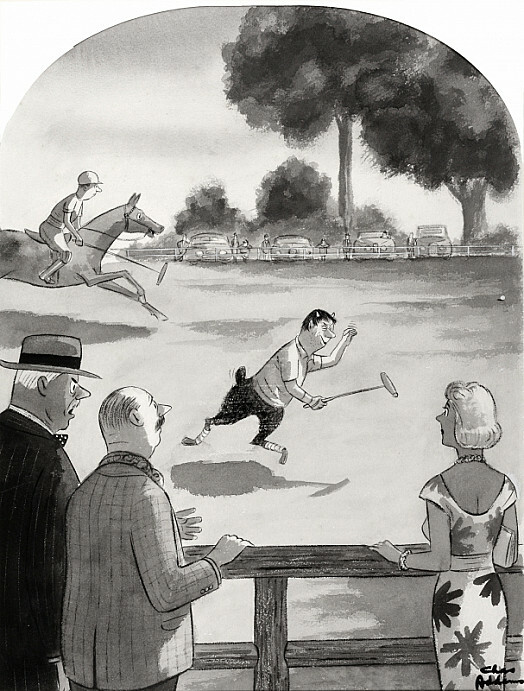 Charles Addams was born in Westfield, New Jersey, on 7 January 1912, the son of Charles Huey Addams, an executive of the Aeolian (Organ) Company, and his wife, Grace M Spear. He attended Westfield High School and, encouraged by his father to draw, contributed cartoons to its literary magazine, Weathervane. In 1929, he enrolled at Colgate University, Hamilton Village, NY, but transferred to the University of Pennsylvania after a year, and then, just a year later, left to study art at the Grand Central School of Art in New York City. Addams began his career as an artist, in 1933, in the layout department of the magazine, True Detective, where his tasks included the retouching of photographs of corpses. However, he contributed his first drawing to The New Yorker in 1932, and worked regularly, on a freelance basis, for that magazine from 1938, when it published the first cartoon containing examples of his immortal cast of characters, which would eventually be known as the Addams Family. He would also contribute to Collier’s, Town & Country and TV Guide, among other periodicals. The first of several anthologies, Drawn and Quartered, appeared in 1942. During the Second World War, Addams served at the Signal Corps Photographic Center in Astoria, Long Island City, Queens, New York, where he made animated training films for the United States Army. In 1946, his illustration to a short story by the science fiction writer, Ray Bradbury, was published in Mademoiselle magazine, and led to the development of a close friendship and collaboration. While Addams had many pleasurable affairs, two of his most serious relationships with women were troubled. In 1943, he married his first wife, the former model, Barbara Jean Day, but his refusal to adopt a child led to their divorce eight years later, in 1951. His second marriage, to Barbara Barb, was even less successful, lasting just two years, from 1954 to 1956. A practising lawyer, she ‘combined Morticia-like looks with diabolical legal scheming’, which enabled her to persuade Addams to give away various of his legal rights (Janet Maslin, ‘In Search of the Dark Muse of a Master of the Macabre’, The New York Times, 26 October 2006). It took a long time before he entered into a third, and happy, marriage with Marilyn Matthews Miller in 1980. In the post-war period, the work of Addams proved to be phenomenally popular and critically successful. He received the Yale Humor Award in 1954 and a special Edgar Award from the Mystery Writers of America in 1961, and was the subject of a solo exhibition at the Museum of the City of New York in 1956. Merchandising and spinoffs included, most notably, The Addams Family television series, which ran on ABC for two seasons, from 1964 to 1966, and crystallised his imagination. While retaining an apartment in midtown Manhattan, the Addamses moved to Sagaponack, New York, in 1985, giving their estate the appropriate name of The Swamp. Addams died at St Clare’s Hospital and Health Center, New York, following a heart attack, on 29 September 1988. His work is represented in numerous public collections, including The Library of Congress, The Museum of the City of New York and The New York Public Library.